Shabbat Services tend to have the same order of business: the same opening prayers, sometimes a different melody here and there. And the night always closes out with the same hits: Aleinu and Adon Olam. And much like Shabbat Services, it seems as if arena rockers Guns N' Roses have been around forever, clinging to time-tested routines and hits that have galvanized the masses for years. Barchu "Welcome to the Jungle"
Sh'ma "You Could Be Mine"
for being the best crowd ever. Torah Blessing "Sweet Child O'Mine"
Sermon / Announcements Shameless promotion of new album nobody cares about. 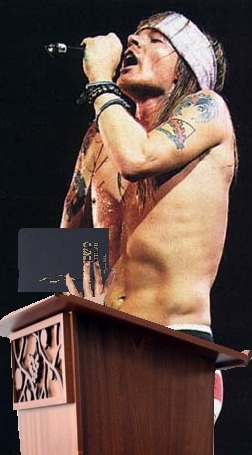 Mourner's Kaddish "Knockin' on Heaven's Door"
So the next time you are at a Guns N' Roses concert, shout "Yasher koach" in the direction of Axl Rose. But only if that flaky drunk deserves it. Oh and by the way, Slash the guitarist ---whose birth name is Saul Hudson---is Jewish.